The Pro Am Tahiti Open golf event is open to all amateur players with a handicap of 24 and under and of course non playing travelling companions are welcome! This trip is perfect for all lovers of golf. 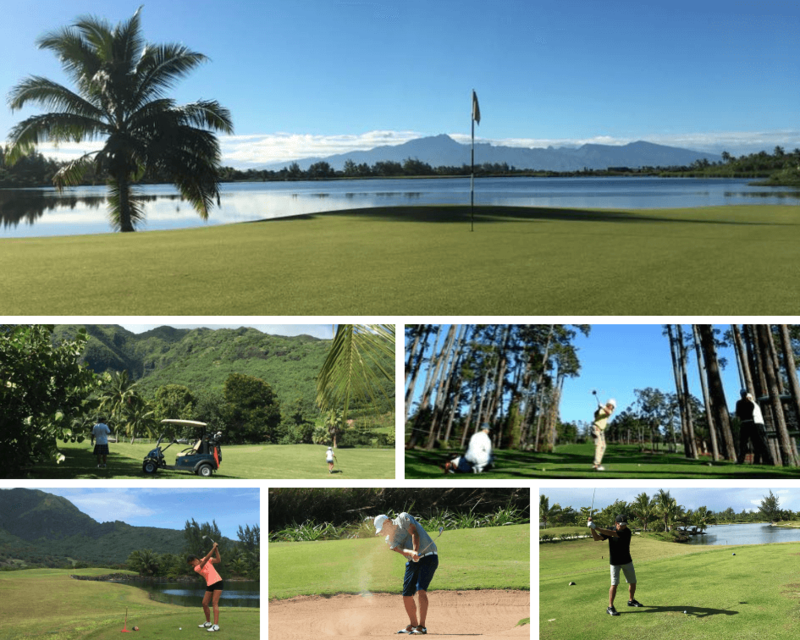 If you’re up for a challenge, sign up and play in the Pro Am event then stick around for the Tahiti Open golf tournament, part of the Australian PGA circuit. Stay a while longer and play a few rounds after the event then celebrate the 19th hole back in your Overwater Bungalow! The Pro Am event takes place on Monday 23 Sep with the Tahiti Open golf pro tournament kicking off on Tuesday and running through until Friday. 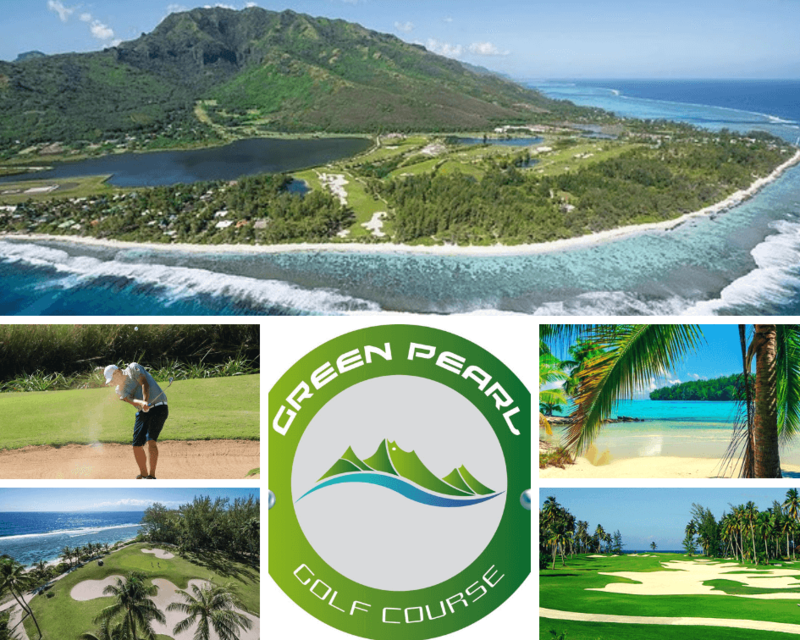 The event takes places at the Moorea Pearl Green Golf Course, a stunning lagoon-side Jack Nicklaus designed course. The front 9 has challenging fairway bunkers of varying sizes. 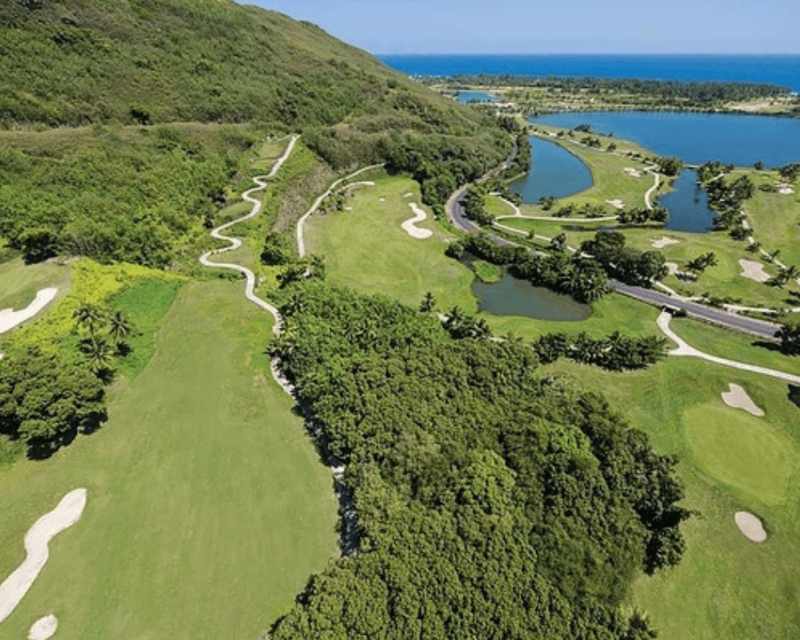 The back 9, surrounded by tropical foliage and offering breathtaking views across the ocean, is much more challenging with its 5 mountain holes and narrow fairways. Your pre and post event accommodation in Tahiti will be at the modern, and recently renovated, 3* Manava Suite Tahiti hotel. This hotel is ideally located lagoon front with a large infinity pool, swim up pool bar and sublime views across to Moorea, especially at sunset. On the island of Moorea you’ll spend 7 nights at the boutique 4* Manava Beach Resort & Spa Moorea. This resort is nestled lagoon-front, just by the village of Maharepa, near the majestic Cook’s Bay. The resort is a traditional and contemporary Polynesian style resort with an infinity edge pool, an on-site spa, and an on-site diving centre. In Moorea you’ll also get to experience the beauty and splendours of the Moorea lagoon on your guided lagoon tour. You’ll get to snorkel and relax and also have the chance to meet the local aquatic residents … the sting rays & sharks! This trip truly is the perfect mix of golf time and own time. You can choose the days you want to follow the tournament and when you prefer to just relax by the pool. If you decide to take the Overwater Bungalow package then believe us you’ll probably never want to leave your bungalow deck! Round trip economy airfares with Air Tahiti Nui from Sydney, Melbourne or Brisbane to Papeete, travelling via Auckland and crossing the international dateline to arrive in Tahiti on Saturday 21 September 2019. A half day guided lagoon excursion in Moorea. SOLO and TRIPLE room share packages available. Departures from other Australian capital cities and New Zealand cities are available. Business Class airfare upgrades are available. Contact us for revised package prices and details. 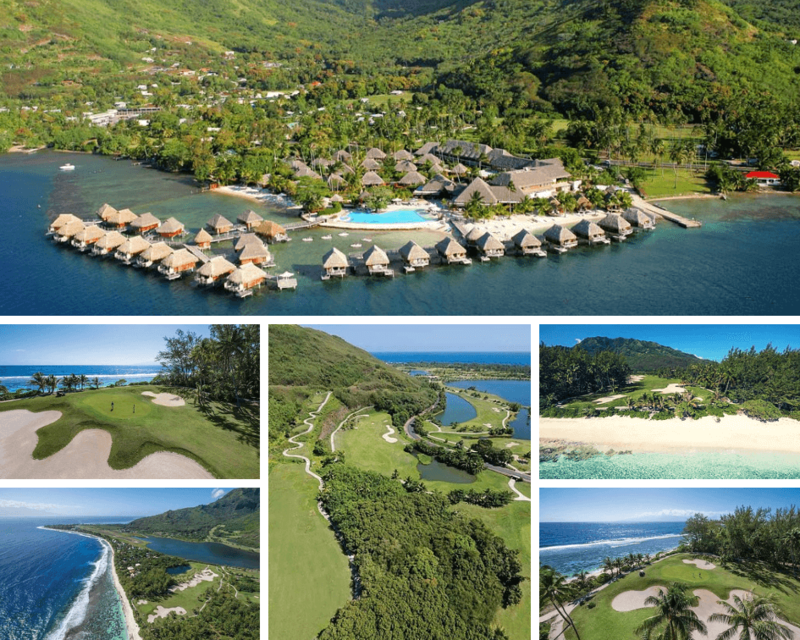 How do I book this Tahiti Open golf event package? A non-refundable deposit of $200 per person is required at the time of booking, along with the completion of our online booking form and a copy of the information page of your passport. IMPORTANT NOTE: A further payment for the airfare portion of your booking (approx. $1,500 pp) is required within 20 days of booking your trip. This airfare payment may be deferred until the final payment date however your seats on the aircraft cannot be held and airfare prices may increase at any time without notice. Your trip price, including airfares, will be recalculated at the time you are able to pay for your airfares. Your booking cannot be confirmed until all requested information and payments have been received by Travel & Tonic. Full payment for your trip is required on or before Wednesday 24 July 2019. This payment deadline must be strictly adhered to or your booking will be automatically cancelled without notice. Should you be unable to make payment prior to this date, please contact us. Bookings made within 30-days prior to departure must be fully paid at the time of booking in order to obtain confirmation. All bookings are subject to availability at the time of booking. Payment of your non-refundable booking deposit deems your understanding and acceptance of our full Travel & Tonic booking conditions. To participate in the Pro Am event, players must have a handicap of 24 or under. A travel insurance policy covering cancellation is strongly advised as some cancellation penalties imposed by suppliers are strict. All pricing supplied by Travel & Tonic (written or verbal) is subject to change without notice until paid in full and this is due to possible fluctuations in foreign exchange rates. Trip prices are based on special discounted wholesale rates and not eligible for airline or hotel reward point programs or upgrades. All advertised prices are in Australian dollars. They are per person and are based on double/twin occupancy and unless otherwise stated they are subject to availability. If we advertise a trip led by a Host and that Host for whatever reason beyond our control is unable to attend, Travel & Tonic reserves the right to proceed with the trip without the presence of that Host. Travel & Tonic will do all things reasonable to replace that Host with a Host of similar experience and qualifications. Our standard cancellation procedures will apply if you wish to cancel your booking.